Climate models have nothing to do with reality — so how can we use them to predict the future? The models do a good job of simulating past climate change, and they are a reliable guide to the future. We know our climate is warming — and models show it will continue to warm into the future. But how can we trust something that is “just a model”? Climate models are kind of like cars. The rules of physics form the foundation of climate models, just like wheels are part of a car body. And real-life data make models run, much like gas in a car’s tank. Like cars, climate models are thoroughly tested before they’re considered reliable. One way to test a model is to ask what happened in past decades. If the model represents what actually occurred, we can expect the model will be reasonably reliable in projecting future change. Thanks to this diligence, our climate models have a great track record. Moreover, they’ve tended to be conservative in their projections, meaning that temperatures and sea levels are increasing more quickly than what models said would occur. Scientists know that emissions of carbon dioxide will warm the planet. We’ve known that since the 1800s. The basic science and our understanding have only gotten stronger over the years. We have many reasons for knowing this. First, the temperatures have been rising since instruments have been making accurate measurements. Second, we see more heat entering the planet’s atmosphere than leaving it. Third, we can look back into time with ice cores, tree rings, coral records, and other signals from nature that clearly show temperature and carbon dioxide rising and falling together. Fourth, lab experiments show that carbon dioxide absorbs infrared heat. Finally, climate models have shown us that as carbon dioxide rises, temperatures should follow. Climate models can be thought of as virtual reality environments. They are programs run on powerful computers that account for the atmosphere, the sun, the oceans, and many other components of the climate. While climate models are just one of our tools, they are especially important because they allow us to predict what the future will be like. None of the other four techniques from the preceding paragraph can look into the future; only models can. So, how good are the models? Well, the first thing to check is how well they are able to model what happened in the past. If a model was able to simulate what happened last century, it gives us more confidence that it can predict the future. Figure 1 shows results of model predictions of the past century. The black line is the actual temperatures, the yellow lines are individual models and the red line is the average of the models. You can see that the models aren’t perfect, but they are pretty good. The models are able to capture the general rising temperatures. Also, the models predict temperature decreases just after the volcanic eruptions listed in the annotations. So, can we go forward in time? The answer is yes. Figure 2 shows the results of predictions that were made in 2000. All temperatures after 2000 were predicted by the models. The black line is the best estimate with the grey bands being the uncertainty. 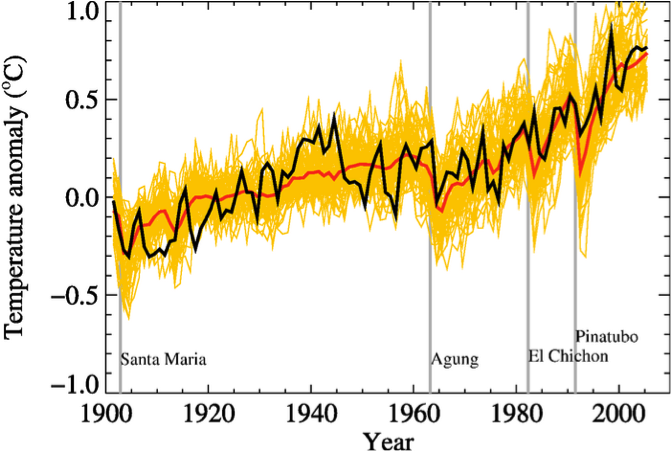 Also shown on the figure are three temperatures measured by three different institutions. It is clear that all three temperatures are within the grey uncertainty bands. It is also clear that some years the predictions are too low and some years the predictions are too high. One major reason why the predictions aren’t even better than they are is because of the El Niño-La Niña cycle. This is a cycle of water circulation that causes temporary heating or cooling of the planet. In the figure, four La Niña cycles are noted. It is not surprising that those years are relatively cool. As of this writing (summer 2012), a La Niña cycle is ending so we will see temperatures rise again, significantly, next year. We conclude that while models aren’t perfect, they are able to closely calculate the Earth's temperature. 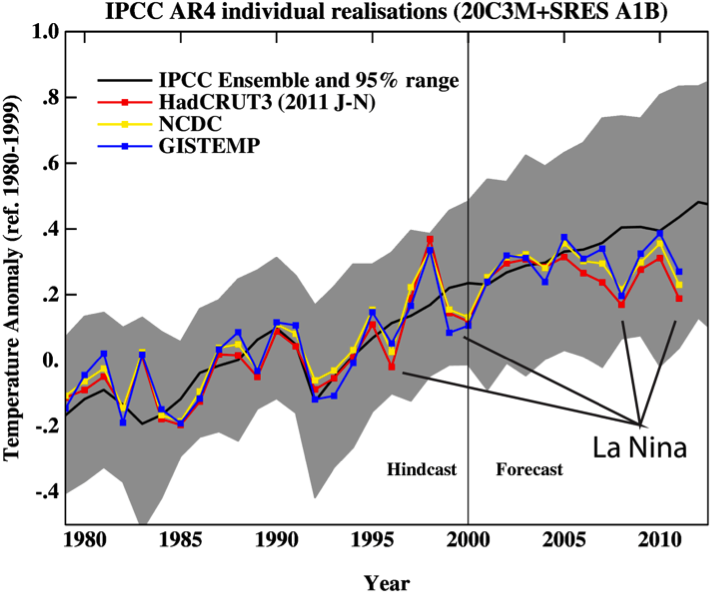 Figure 2: Comparison of model predictions made in 2000 with actual temperature results. Courtesy of Gavin Schmidt/RealClimate.org. The real question to ask is, are these models good enough to help us make decisions now? The answer most climate scientists give is yes, they are. And it is prudent to listen to the message they are sending.